The best baby photo ever! One of my husband's colleagues and his wife have a new son – Theo. They sent this photo (and gave me permission to share it with you). As the proud parent of two sons and two grandchildren I've gotta say – this is may be the best newborn photo taken by a non-professional that I've seen. Theo is handsome but it's more than that. In this photo he's looking at you. He's not just looking. You can see that there is a brain working behind those eyes. It's lovely that this photo captures that. I think that all babies are thinking about what they see, but it's not often that a photo captures it. I cannot go back and take this great a photo of my own children but if I could, I would try to capture the spirit of this photo. As a quilter I also have to say that I want to feel the blanket Theo is wrapped in. The stars are printed on… what? It looks like a quilted gauze. If I'm lucky Theo's parents will at some point let me see this blanket. If they do I'll report back. That said – these are parents of an infant and I'll bet real money that they are going to be sleep deprived for kind of a long time. If they forget that I'd like to touch the blanket I will so understand. I loved my boys. I love my grandchildren. I did not love sleep deprivation and I would not willingly ever go back to being the parent of a baby. I like my children older. Chris at 30 and Jeff at almost 27 seem to me to be the absolute perfect ages for children. Elanor at 9 is really good. Jack at 4 – I love him a lot – but really, he's going to get better with age. UPDATE: I found out that this swaddling cloth came from Aden + Anais. There is a set of four with different colored stars. I think they might make nice, short curtains too. 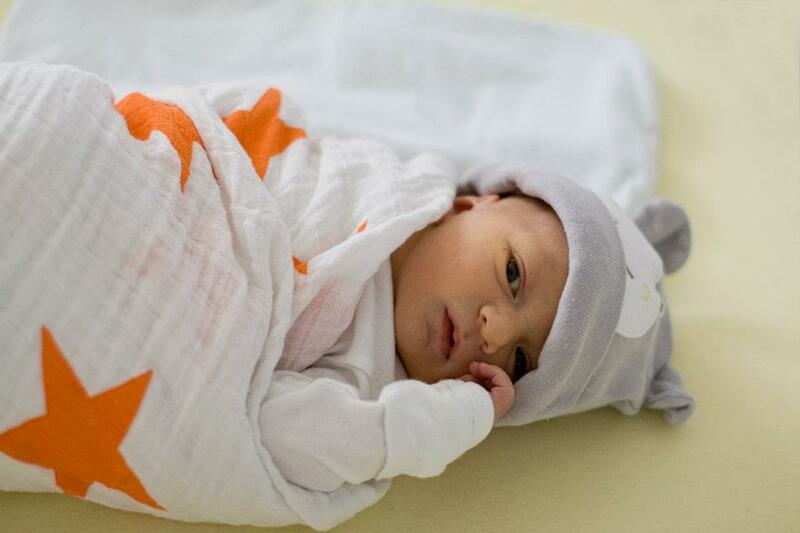 Its gauze…all the new parents have them for tight swaddling without bulk. My daughter actually didn’t like them much but my granddaughter loves to be swaddled in a heavy knit. Even at 6mo she settles right down when you wrap her up. Love this photo! Ha! I tended a puppy for two weeks over the holidays so getting better with age is fresh in my mind! I will find it easy to say “sorry but no” should a situation like that arise again. It was exhausting. That sleep thing….. when I no longer wanted to even consider getting up in the middle of the night… I KNEW I wanted no more children!! Great photo – and post! I agree that kids get “better” with age – although babies are pretty darn cute to borrow for a while!